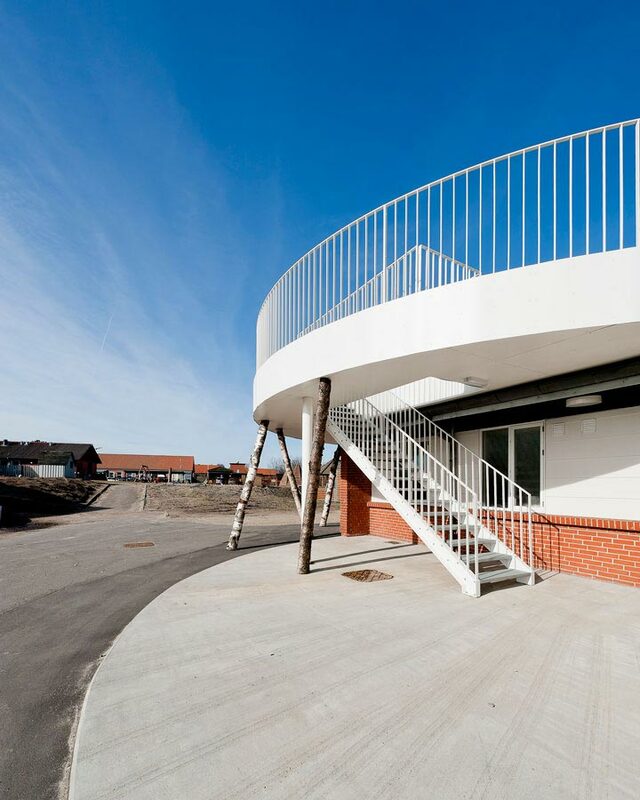 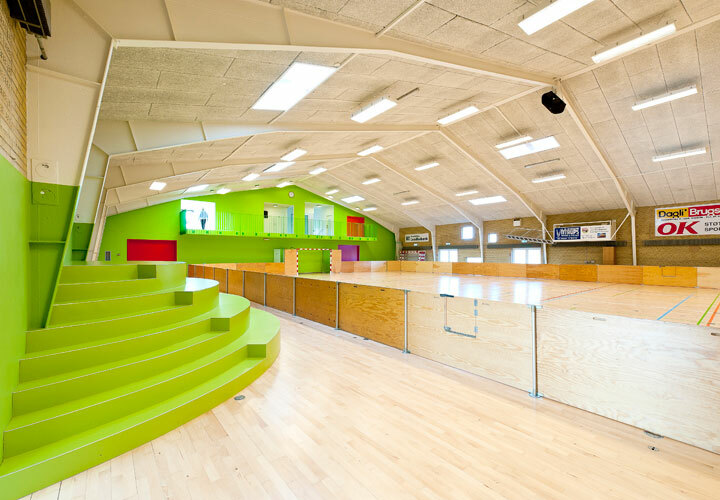 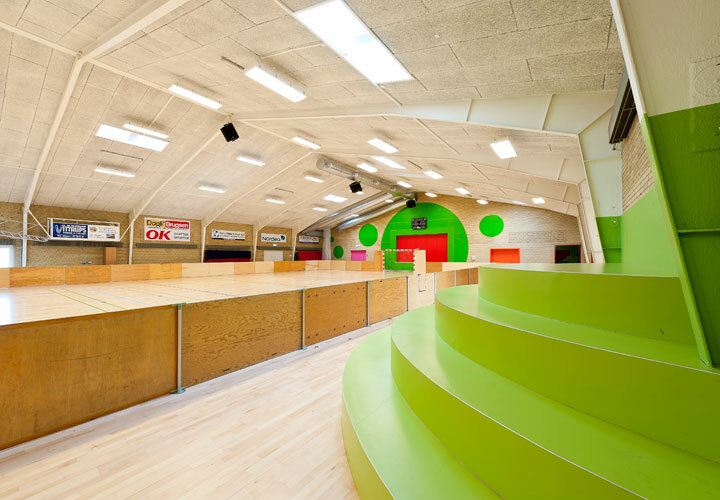 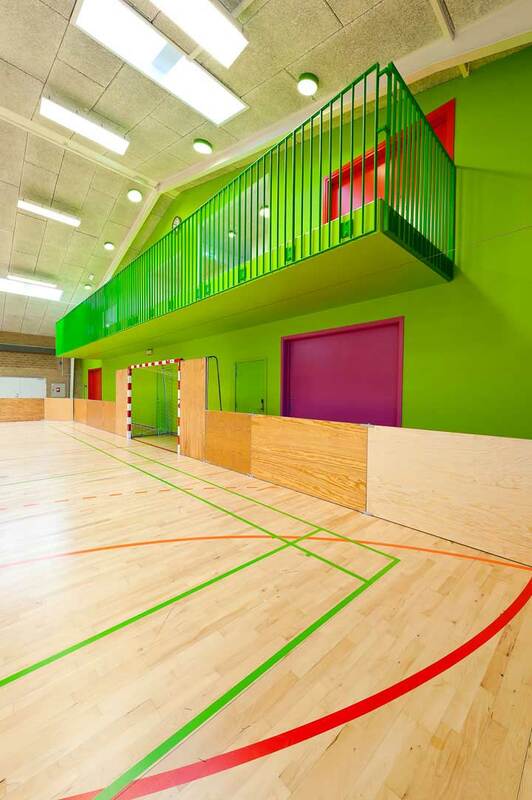 The refurbishment and revitalisation of this old, worn-out sports hall from 1975 in Sønder Nissum is part of the initiative ‘New life to old halls’ by The Danish Foundation for Culture and Sports Facilities (LOA-fonden). 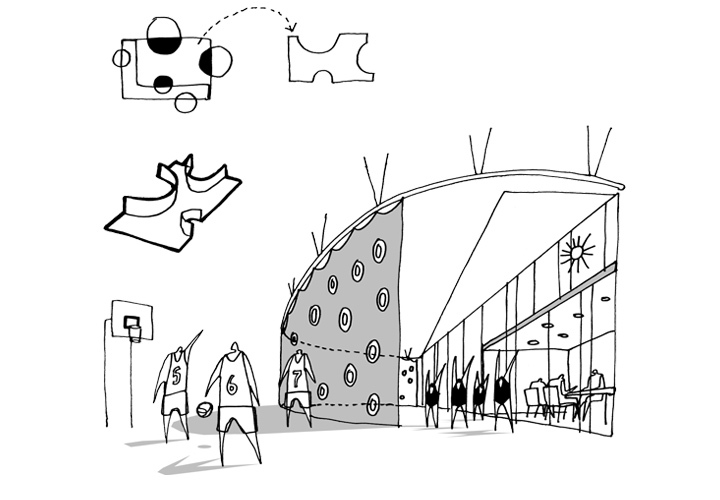 The initiative aims at illustrating how the numerous outdated sports centres around the country can be turned into modern sports and cultural centres with exciting architecture and a flexible functionality within a small, restricted budget of DKK 10 mio. 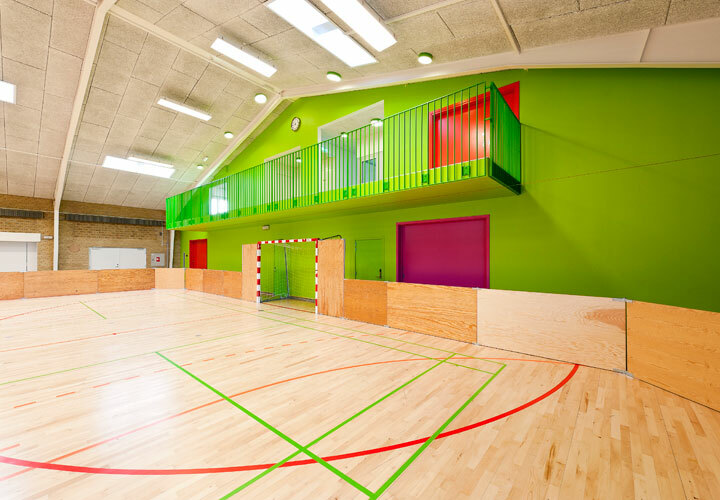 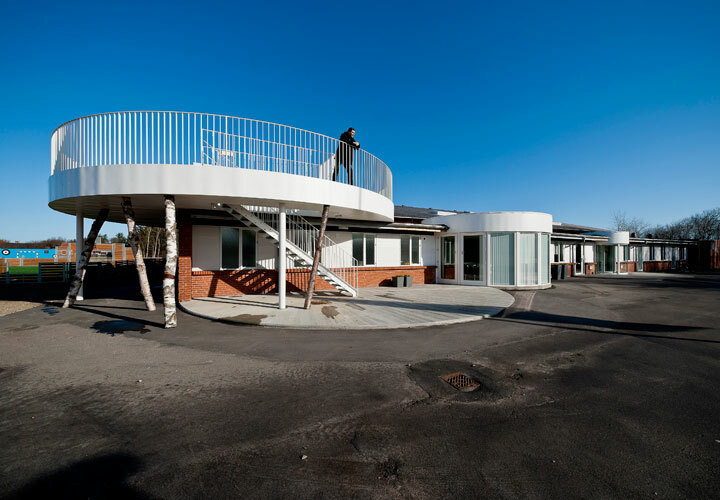 An initial key challenge posed by financial framework consisted in deciding whether to modernise the entire building or to prioritise a series of focus areas. 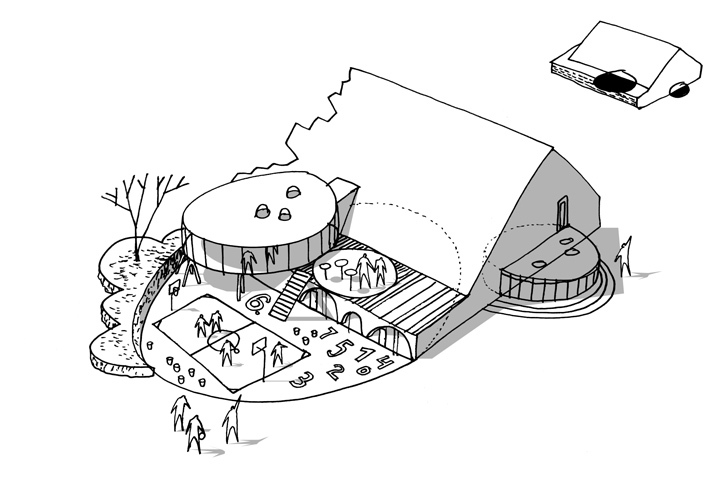 We decided on the latter in order to be able to set to work with a more ambitious and innovative approach. 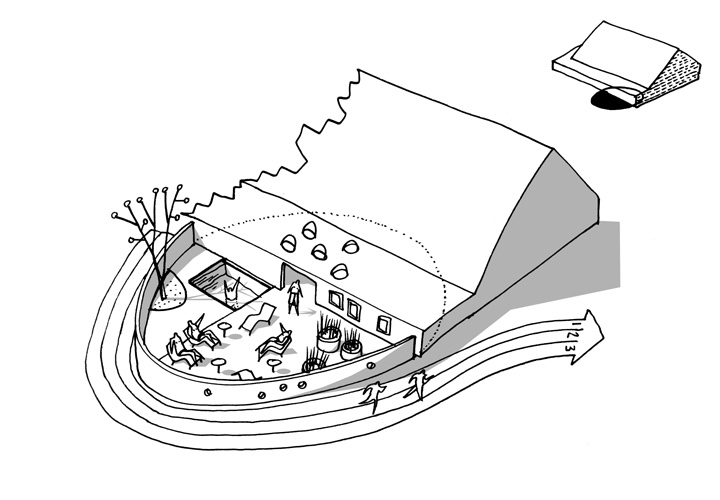 Thus, the idea for the modernisation is based on a concept of “Spots” – the localisation of particular areas within the hall, where it makes the most sense to carry out alterations. 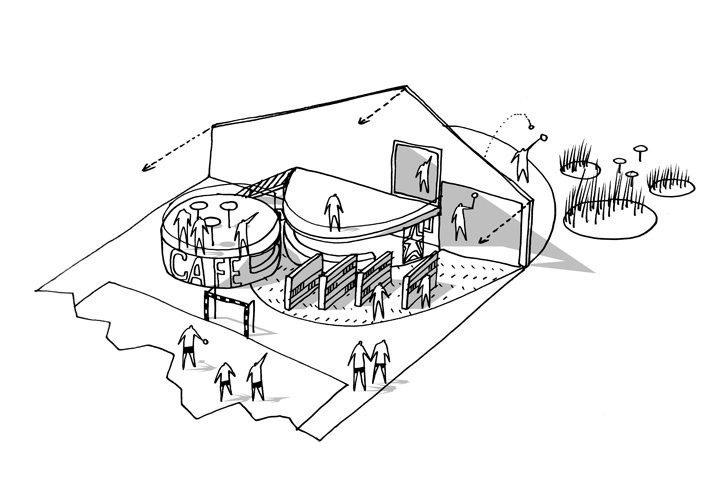 This flexible strategy contains a high degree of adaptability and can be customised according to the needs of the local community. 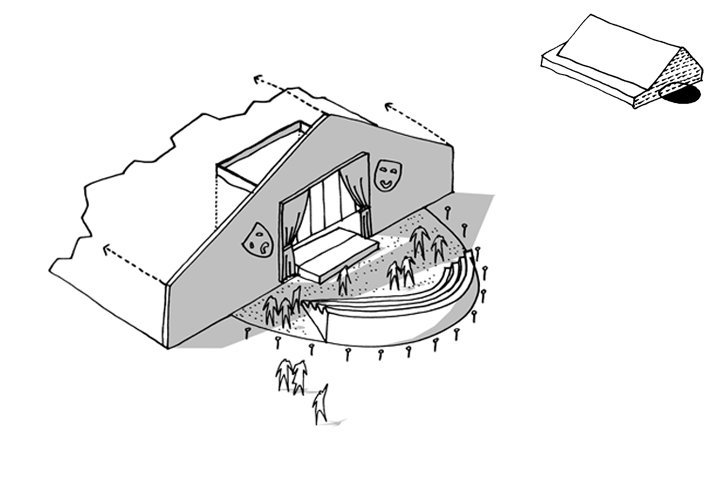 The function, number and form of the individual spots depended entirely on the hall’s existing surroundings as well as on its users and their wishes. 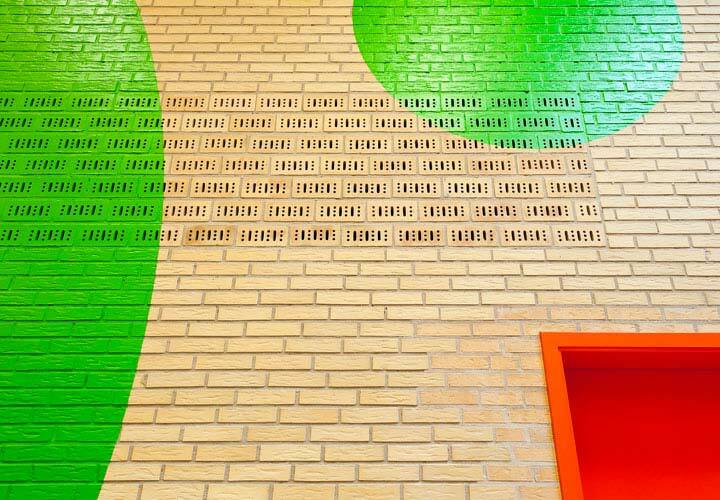 Even though new functions, lighting conditions or applications are introduced, the spot-idea allows for creating an architectural whole by focusing on a close coherence between the spots in terms of colour, materials and design. 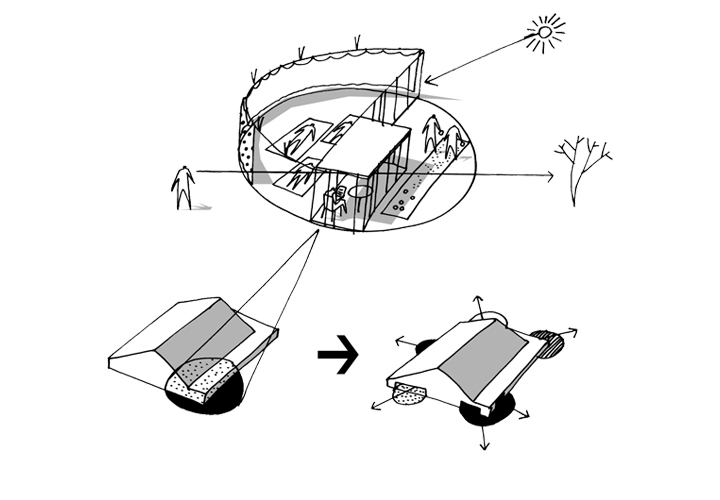 The spots are placed both inside, outside or on the border between interior and exterior of the building. 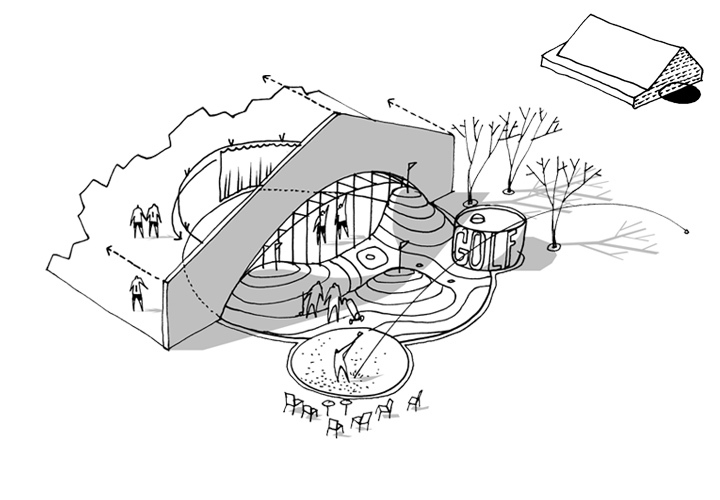 The outside locations are used to draw attention to particular activities or areas, depending on the surroundings. 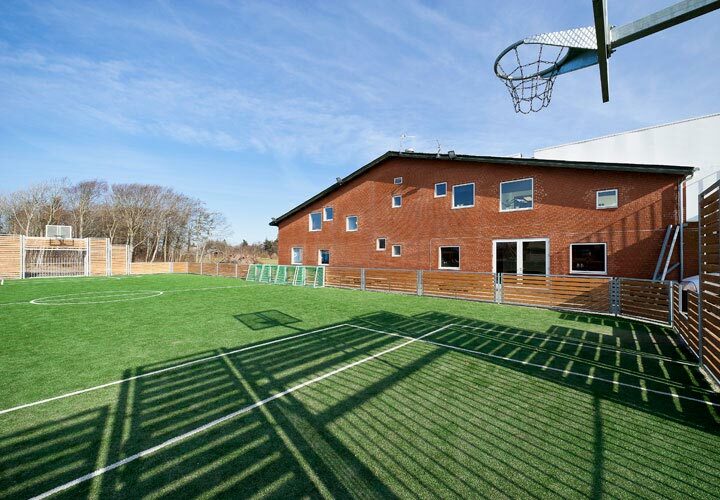 Some activities need shadow or lee while other spots demand proximity to the parking lot or connection to the playing field. 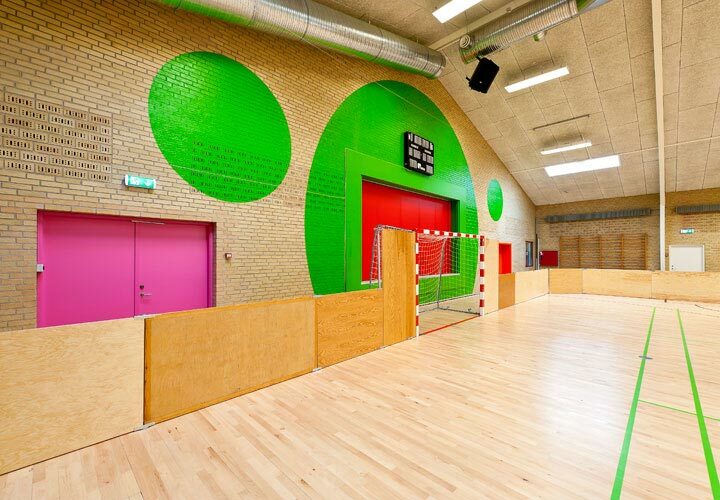 Correspondingly, the placement and function of the interior spots is determined by the existing organisation and the meaningful interaction between the different activities in terms of noise levels, space requirements and infrastructure.